In 1991, the TPLF/EPRDF, a Marxist-Leninist rebel group, took state power in Ethiopia, sanctioned by the United States of America. But taking state power militarily violates the fundamental principle of democracy, representation and playing by fair rules. It is a one-party state. In a one-party state, voting is a formality and its results become predictable. 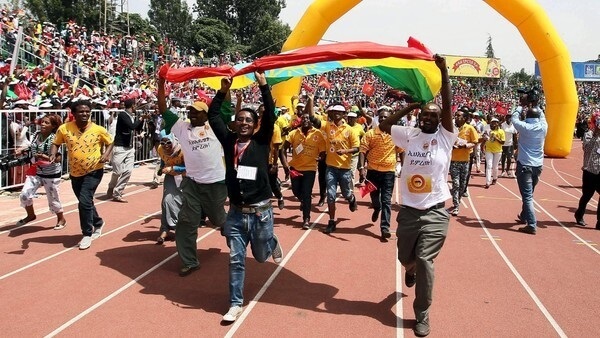 The real issue facing Ethiopia is a transition from a one-party state to a democracy. For instance, in the late 1980s, Ethiopia and Eastern European countries were both under a Marxist-Leninist, one-party rule. While Eastern European countries transitioned to a democracy, Ethiopia did not. There are useful lessons to be learned from the successful experience of Eastern Europe. When the Second World War ended in 1945, the Allied Powers agreed that Eastern Europe would be Soviet Union’s “sphere of influence.” Consequently, the Soviet Union imposed Marxist-Leninist, one-party states on Eastern European countries. For the following forty five years, these countries lived under one-party tyranny, marred by imprisonment, state murder and corruption. Then the fate of Eastern Europe, all of a sudden, changed for the better when the Soviet Union was compelled to introduce its own reforms in the late 1980s. The Soviet Union encouraged similar reforms in its satellite states. This new development signaled that there would be no anti-reform interventions in these countries by the Soviet Union unlike in the Hungarian uprising of 1956 and the Czech reforms of 1968. Consequently, intellectuals and labor leaders in Eastern European countries seized this opportunity and created open and free discussion groups to think about an alternative political system for their societies. These discussion groups helped provide new leaders for the 1989 freedom and democracy movements in Eastern Europe. The new leaders were convinced that a Marxist-Leninist, one-party state had failed to create free and just societies in Eastern Europe. They were, therefore, not interested in reforming the one-party rule. Their primary goal was to replace it with a new system, which will respect individual freedom and allow the fulfillment of human potential. Thus, they adopted the philosophy of liberal democracy, embracing its fundamental values of civil and political rights, freedom of expression and economic liberty. Next, they organized extensive campaigns against the system of one-party rule. The ruling regimes finally began to disintegrate as a result of the intense pressure created by the relentless campaigns. In Poland, the Solidarity Movement managed to force the Communist government to roundtable talks, which produced a new constitution. The Constitution provided for free elections for a bicameral legislature, and all parties, including former Communists, were allowed to compete. In Hungary, the Democratic Forum, a pro-democracy coalition, persuaded the Communist regime to reach a roundtable agreement on a democracy package. This included freedom of association, assembly and the press; and a new electoral law, fundamentally changing the existing constitution. In Bulgaria, the Union of Democratic Forces used the Polish model of roundtable talks and reached an agreement with the government on transition to a democracy. The freedom and democracy movements in Eastern European countries, with the exception of Romania, were remarkably peaceful. Czechoslovakia’s “Velvet Revolution” was able to assemble, at one point, as many as 800,000 peaceful protesters at Prague. Such a mass movement ultimately brought down the Communist government and transitioned the country to a democracy. The 1989 popular protests in Eastern European countries succeeded because of three major factors: the Soviet reforms of the 1980s, the unity of purpose among the intellectual communities and political reformers, and finally the external support from the Roman Catholic Church, and the United States and its the Western allies. What are some of the lessons that Ethiopia’s intellectuals and political reformers can take? In the first place, they have to come together and discuss openly and freely what kind of society they want to build for Ethiopia. They have to have first their own roundtable talks to sort out their divergent views. It is not hard to criticize the TPLF/EPRDF regime. It is not hard to constantly argue with one another. It is not hard to complain (abaetuta) to world powers (as if they would care) hoping to use them or be used by them. On the other hand, what is hard, but is a sensible thing to do, is to come together and discuss intelligently in order to reach a consensus to abandon the system of one-party rule and transition the country to a democracy. There are presently two impediments to this. One is a parochial outlook. The other is a Marxist-Leninist mindset, which has been institutionalized in Ethiopia in the last forty years. Ethiopia’s intellectuals have to show independence and think objectively to tackle the real issue facing the country and provide voice of conscience for leadership and development of their society. Finally, no mass movement for freedom and democracy can succeed without an international alliance. For instance, Eastern European countries were able to receive the support of the Roman Catholic Church and the Free World because, for one, their struggle coincided, luckily, with the interests of the Free World. But more importantly, the people were determined to end the system of one-party rule and transition to a democracy. Thus, if the people of Ethiopia get united in their opposition to the system of one-party rule and demand a transition to a democracy, it will not be in the best interest of the United States and its Western allies, or any other country, to continue to stand by the TPLF/EPRDF regime. Furthermore, it needs to be mentioned that change is primarily internal; not external. In the final analysis, the responsibility to end the system of one-party rule and transition the country to a democracy rests on the people of Ethiopia themselves. Only working together in unison with one another can they fulfill this responsibility. Emeritus Professor of Economics at Ferris State University; UW-Whitewater; teferrad@uww.edu.